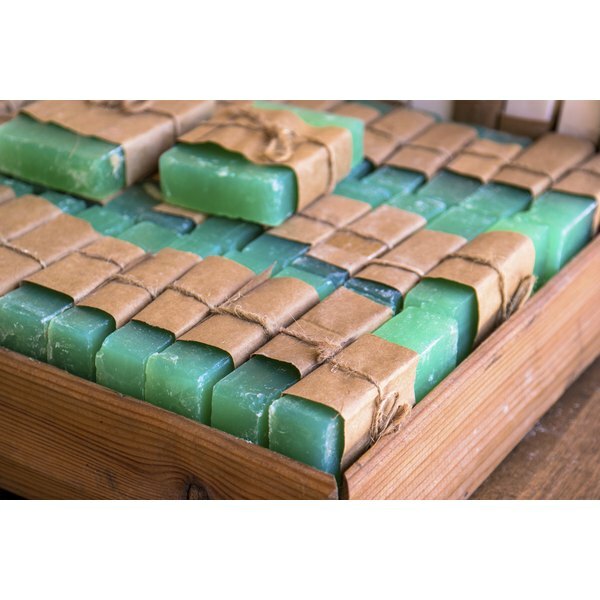 A couple bars of green soap. Grandpa brand pine tar soap has a rich history. Manufactured by C.S. Dent and Company beginning in 1878 from a family recipe, Grandpa's pine tar soap has been used as a cleanser, shampoo, detergent and treatment for a variety of skin problems. The company claims the soap is 100 percent biodegradable. Grandpa's pine tar soap contains just seven ingredients. Grandpa brand pine tar soap contains two specific cleansers: sodium tallowate, sodium cocoate Sodium tallowate is a mixture of lye, or sodium hydroxide, animal fat and steam. Sodium tallowate is created in a process called saponification wherein the animal fat and lye are steamed. The fats break down in this process, and the fats and salts now known as sodium tallowate are skimmed from the mixture and used in the soap, as outlined in “The Handbook of Soap Manufacture.” Sodium cocoate is the name given to the fatty acid salts of coconut oil. The pine tar oil in Grandpa's pine tar soap comes from the Pinus palustris tree, commonly known as the longleaf pine, native to the southeastern United States. Pine tar is harvested by turning pine wood into carbon using heat and pressure. The kiln used to create pine tar oil needs to be closed, otherwise carcinogenic debris known as creosote can form, a process outlined by the Department of Health and Human Services' Agency for Toxic Substances and Disease Registry. Grandpa's pine tar soap is labeled as creosote free. A traditional home cleanser, pine tar oil is also used in the treatment of inflammatory skin diseases, such as psoriasis, acne and rosacea. A 1996 article in the medical journal Dermatology suggests that there is at least limited evidence in the efficacy of pine tar as a treatment for skin disorders. Grandpa's pine tar soap contains water, an instant moisturizer and a substance that gives the soap some texture. Glycerin is a fatty moisturizer. It is hygroscopic in nature, meaning it draws moisture from the environment to the skin. There are two additional ingredients in Grandpa brand pine tar soap. Pentasodium pentetate is an emulsifier, meaning it keeps the oil and water based ingredients in the soap from separating. Pentasodium pentetate also acts as a chelating agent, keeping the product from degrading due to exposure to metals, as outlined in “A Consumer's Dictionary of Cosmetic Ingredients.” It keeps the soap from oxidizing and allows the fragrance and texture to remain intact. 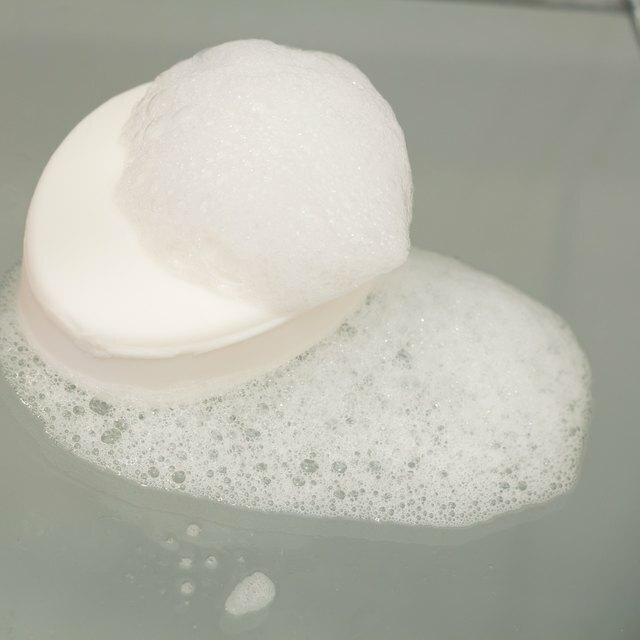 Tetrasodium etidronate is a water softener, used to prevent Grandpa's pine tar soap from leaving behind residue or soap scum.